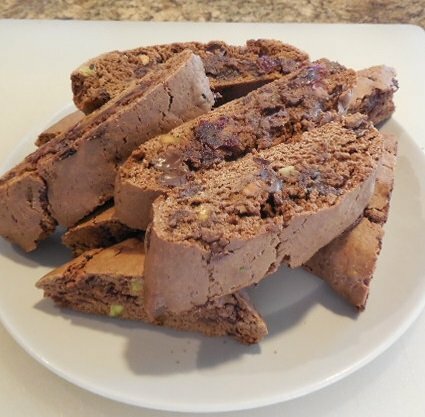 Actually these Chocolate Pistachio Biscotti has dried cranberries in it as well. The cranberries add a nice tang to offset the sweet chocolate favor. Cranberries also Have several health benefits. Cranberry juice is often recommended for the prevention and treatment of urinary tract and bladder infections, but the tiny fruits have more many more health benefits. A 2009 study published in the "Health Studies Journal" reports that low-sugar dried cranberries can help regulate blood sugar levels in individuals with type 2 diabetes. A 2010 study published in the "Journal of Food Science" found that dried cranberries retain many of their antioxidants when they are freeze-dried, hot air-dried or vacuum-microwave dried. The antioxidants in dried cranberries can help reduce inflammation, cutting your risk of chronic health problems, such as heart disease and cancer. 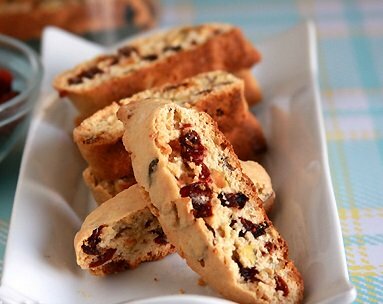 If you want to cut down on the fat and make these Biscotti a bit healthier you can substitute ¾ cup of egg substitute for the 3 whole eggs. 1 cup plus, 1 Tablespoon sugar, divided. Line a baking sheet with parchment paper, or a silicon baking mat. Position one of your oven racks in the middle of your oven and preheat to 350 degrees F.
In a large bowl, cream butter and 1 cup of sugar until light and fluffy. In another bowl, combine flour, cocoa, baking powder and cinnamon and whisk together thoroughly. Add the butter and sugar blend to the flour blend and mix well. Stir in the chocolate chips, cranberries and pistachios, blend until evenly distributed. Turn dough on to lightly floured surface and knead briefly, until dough comes together. Divide into two equal portions and transfer to prepared baking sheet. Shape each portion into a 10x1 ½ inch log. Sprinkle each with remaining sugar. Place into preheated oven and bake for 20-25 minutes or until set. Remove from oven and place pan on rack to cool for 10 minutes. Transfer logs to a cutting board and slice each log in about 10 slices. Return biscotti to pan, placing on a cut side. Return to oven and bake for 5-8 minutes, turn over and bake on other side for an additional –8 minutes. 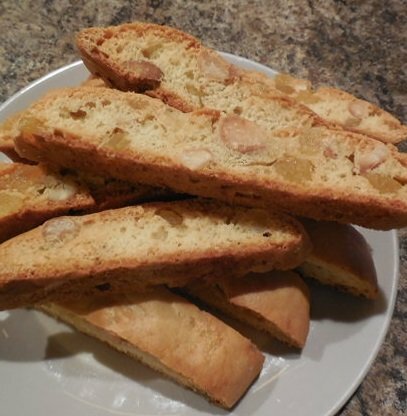 Biscotti should be slightly crisp on edges. 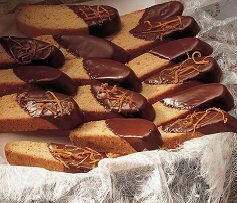 Remove from oven and place biscotti on cooling racks, cool completely. Store in an airtight container to maintain freshness. 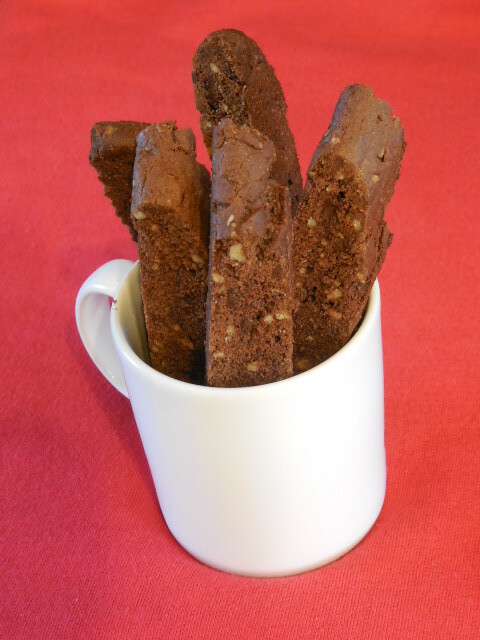 These Chocolate Pistachio Biscotti become amazing when you use the best nuts, dried cranberries and cocoa you can afford. I purcahse a lot of my ingredients on line, I get the best quality at great price and save a great deal of time, not running from store to store looking for the best.